Sisters at dusk in the Aboriginal community of Wilcannia, NSW. An Aboriginal families hand prints immortalized in a concrete at their home in Wilcannia, NSW. Rhianna Harris, aged 5, in an empty lot near her home in Wilcannia. A kangaroo is gutted in the bushland surrounding the Aboriginal community of Wilcannia. Storm clouds at dusk over Wilcannia. Men relax inside and out of the heat of the day in Wilcannia, NSW. An abandoned bicycle in Wilcannia, NSW. A kangaroo torso, left for the dogs in Wilcannia, NSW. A rare rainstorm approaches Wilcannia, NSW, ultimately bypassing the town. 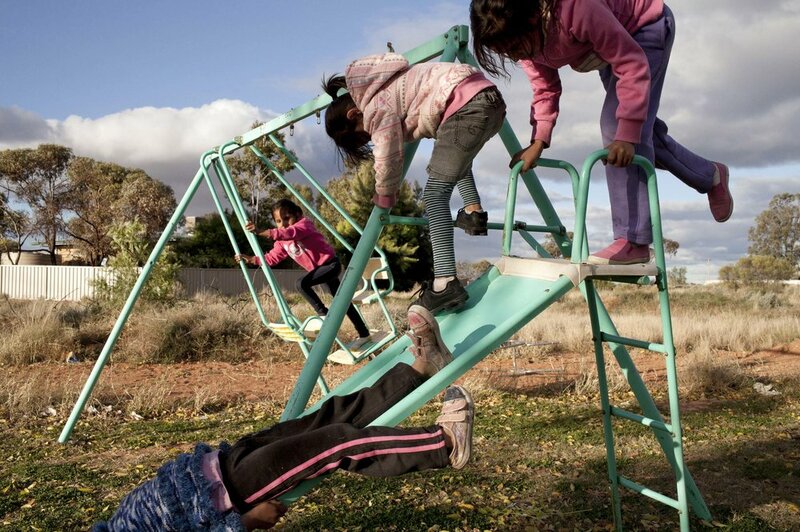 Children at play in Wilcannia, NSW. A shared birthday party for two children in Wilcannia, NSW. A boy plays in the backyard of a neighbours home in Wilcannia, NSW. A young boy waits in a car while his mother buys alcohol at the local club in Wilcannia, NSW. A mural in downtown Wilcannia, NSW shows the point of first contact for the local Barkindji Aboriginal people. Hunting dogs subdue a wild boar on a nighttime hunt in Wilcannia, NSW. Barkindji men use a spotlight during a nighttime hunt in Wilcannia, NSW. The Darling river, lifeblood to the Barkindji people in Wilcannia, NSW. Barkindji men cook a hunted Emu in the ground the traditional way in Wilcannia, NSW. Local Barkindji children at the end of the day in Wilcannia, NSW. A young girl cries after a fight with her sister in Wilcannia, NSW. Eight stitches across the forehead after a drunken altercation the night before in Wilcannia, NSW. Children play in what remains of an abandoned house in Wilcannia, NSW. Storm clouds approach in Wilcannia, NSW. Rhianna Harris with her barbie in an empty lot near her home in Wilcannia, NSW.